In presenting my list of favourite New Zealand Native Plants I realise I take these natives totally for granted. For example, I don't know the names of my Hebes - and what about the different types of tussocks I use in the borders? Oops. New Zealand natives have such a variety of foliage and texture, and most (if not all) are evergreen. I often see pictures of my cherished New Zealand plants in British magazines and feel quite superior. These are MY PLANTS!!! I also feel smug when I read the prices of the hybrid Phormiums in British nurseries. These are my bargain bin heroes, my absolute favourites. I hope you'll enjoy my list of New Zealand Native Plants. Please accept my apologies for sometimes not knowing or using the correct botanical names. A much loved and admired New Zealand evergreen native is the small shrubby tree called a Lemonwood, or Pittosporum Eugenoides. The leaves are a shiny green and smell faintly lemony, hence its common name. My garden is full of Cordylines. Many start their Moosey lives as spiky spikes in pots, particularly any have the audacity to be the tiniest bit expensive - like Cordyline Albertii, the super-stylish variegated model. Olearia is a New Zealand evergreen native plant used very successfully for medium sized hedges. The leaves are a clean avocado green, and the shrubs are easy to keep trimmed to size. There are now many different flax (Phormium) hybrids which are available in nurseries and garden centres. A particularly beautiful variety is named Cream Delight. In New Zealand flaxes are very well priced - so I can justify having more than one! A gardener I visited recently has deliberately decided to plant only native New Zealand plants. She's an environmentalist, looking after the regeneration of native bush-forest. Her property is called 'Cloud Farm'. Astelias are spiky aristocrats of the New Zealand native plant scene - whether in the ornamental garden, in pots, or in their natural bush surroundings. I love them. Senecio is a New Zealand shrub with a heart of gold, and it flowers energetically in mid-summer. I love those yellow daisies - and so do my bees! Coprosmas used to be considered boring evergreens with their small, shiny, plain green leaves. There have recently been some new hybrid varieties released with leaves of various colour combinations - much more colourful! Pseudopanax are evergreen shrubs or trees which grow in the New Zealand native bush and forests, and, of course, in the Moosey garden. A Pseudopanax tree can be transformed in a flash (with a little help from saw, loppers, and secateurs) into a luxuriant shrub. Phormium leaves often have the most beautiful stripes, and on one flax bush there can be many different leaf designs. Different colour patterns and subtle colour shades all contribute to the beauty of the whole. Hebes bred in New Zealand normally have sturdy, no-nonsense names like Southern Snow, or Maori names like Wiri Dawn. Imagine my surprise when I found a clutch of Hebes on the nursery sale table called - wait for it - Beverly Hills. High on the list of New Zealand native plants which are taken for granted are the Toetoes (Cortaderias), the New Zealand pampas grasses. They are often banished to country fence lines, well away from a fussy gardener's critical eyes. The yellow flowering Kowhai is a small New Zealand tree whose flowers enjoys iconic status. Each island (north and south) has its own dominant type, but there are also many hybrids in the wild and in gardens. This tree is a sociable separatist! Aargh! My love affair with New Zealand flaxes is officially over. We've broken up - well, some of the big Phormium Tenaxes have been, literally, with the axe, shovel and a sharp kitchen knife. I must get more in touch with the New Zealand native Hebes planted in my garden. The first step is to photograph them all and note their flowering times (and colours). The second step should be to find out their names! Often my new coloured Cordylines start life in pots, then go into the garden when their trunks start to lengthen. This is a striped variety which I ordered from a mail order catalogue - sorry, name forgotten, label lost. New coloured flax (Phormium) hybrids are released in New Zealand every year. The latest pink toned one is called Jester, and I have two growing in different parts of my garden. In all my early garden borders there would be at least one little red flax, or Phormium hybrid. They would brighten up the winter days, and were supposed to stay neat and beautiful throughout the other seasons. This meant that they were supposed to stay red, and stay little. Renga Renga is the New Zealand Maori name for Arthropodium cirratum - one of the best landscaping native plants I have ever grown in my garden. Some local gardeners use the name Rock-Lily. Libertia is often used in council landscaping with other New Zealand native plants. It has strong and striking spiky growth, with a strong burnt-orange stripe on olive green leaves. Variegated Hebes are grown a lot in my garden. The variegated foliage always works well in planting combinations, looking clean and tidy in all seasons. Purple flowers appear in summer, and I love them almost as much as my bumble bees do. In the Apple Tree Border there are some beautifully majestic Chatham Island Forget-me-nots (Myosotidium Hortensia). They arrived as small seedling plants, all blue flowering, and were planted here when this border was well shaded in summer. I have to use the words subtle and stylish to describe the New Zealand native myrtle, Lophomyrtus. It's a small shrub with the most beautiful variegated leaf markings, hardy and easily kept in shape in the mixed garden border. This variegated Coprosma is living for now in a pot, sheltered from the winter frosts. I also have several larger shrubs growing in the Wattle Woods. Yellow Wave is one of the cheeriest New Zealand flax (Phormium) hybrids. It is reasonably large and bulky, and has a weeping form. In some photographs it looks more like a Green Wave - the leaves are much more yellow in summer. I love the geometric symmetry of this small-leafed blue-green hebe. The leaves are like a series of reflections coming up the stem. They are a subtle colour, and the shrub has small white flowers. When Hebes turned up in my local bargain bin I am always tempted. I'll often buy them all, and then find spaces in the garden. Hebes trim easily, make great little hedges, and look beautiful when in flower. And the bees in my garden love them! Anyone who has travelled in New Zealand has experienced the beauty of the tussock grasses, or Carexes, blowing around in the wind. Some hug the ground, some are taller and stiffer, and their colours glow in the sun. 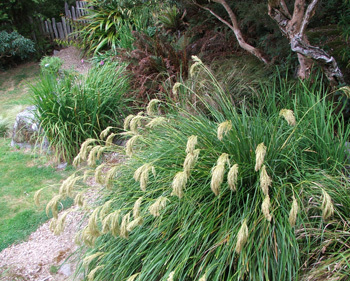 Actually, Carexes are grass-like plants, properly called 'sedges'. There are many beautiful small coloured hybrid flaxes (Phormiums) with red-toned leaves and a variety of different New Zealand names to confuse the gardener - Maori Maiden, Maori Chief, and so on. My favourites are fountain-shaped and grow neatly, never getting too large. Names? Unknown, sorry. The native New Zealand Pepper Tree is a small shrub with red blotches on its leaves. Some are green and some are more a buff or beige colour, depending on how much sun the shrub gets. One of my most favourite of all the plants in the garden is this beautiful hybrid phormium, or flax. I think it's called Tricolor. This is a three dollar bargain bin flax from the local nursery - it has the most amazing coloured stripes I've ever seen in any plant.